APC National Leader, Ahmed Tinubu doesn't want to believe in this reality but it is the truth and his wife has confirmed it. As the national leader of the All Progressives Congress , Asiwaju Bola Tinubu, begins to reconcile warring sides in the ruling party. 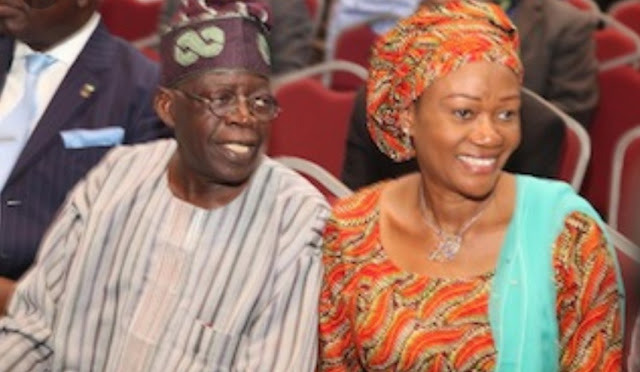 His wife, Senator Oluremi Tinubu, has decried that her husband was “ trashed” after the party won the 2015 elections. President Muhammadu Buhari had mandated Tinubu to reconcile aggrieved party members ahead of the 2019 general elections, an assignment the former governor of Lagos State has since begun. But his wife , who is representing Lagos Central Senatorial District at the Senate , on Monday featured on Your View , a breakfast show of Television Continental , where she alleged that Tinubu was sidelined despite his efforts towards ensuring that APC won the polls. Mrs . Tinubu , who disclosed that she was forced to discourage her husband from his continued loyalty to the Presidency and the APC , said the party leader was always harping on the development of the country. “ He was campaigning, I did too . We were running three campaigns in my house . And for him to be trashed like that? But I saw somebody who has love for this country. I hate to speak because when I stand in the front of God , I don’ t want, because of this man , go to hell. Wife of President Muhammadu Buhari , Aisha Buhari , had lamented that those who worked for her husband to get into power had been sidelined in the scheme of things under the current administration. Mrs . Tinubu however pointed out that despite that the Buhari - led administration was now under massive criticisms , the President remained “ the candidate to beat ” in the forthcoming poll. She said , “Change takes only one person to champion. And you need leadership . For me , Buhari is still the candidate to beat . Leadership is inspirational. Management is technical . If you have all the degrees and you ’ re smart and savvy , it is not about leadership . How many people are you inspiring ?